The Colloquium is inspired by the figure of Ramón Margalef (Barcelona, 1919-2004), who worked for many years in the Institute of Marine Sciences and the University of Barcelona. He was one of the founders of modern ecology and very often applied his ideas to the marine environment. He broke old paradigms and contributed to science with innovating theories about the space-time structure of the ecosystems, the relations between diversity, biodiversity, stability and connectivity, the fundamental paper of energy in the biological productivity and the interrelations between ecological succession and evolution. 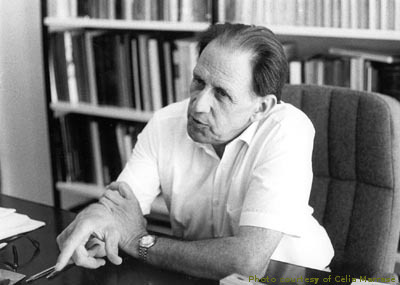 He wrote around 400 papers and books including, “On certain unifying principles in ecology”, “Perspectives in Ecological Theory”, “Information Theory in Ecology”, “Our Biosphere”. Margalef was not only a brilliant scientist but also an encouraging teacher and mentor. Margalef recognized the importance of the physical environment to understand the behavior of species and ecosystems, and this tradition has continued for many years within the Institute of Marine Sciences. We believe this Colloquia will be an excellent opportunity to foster lectures and discussions on the relevance of a cross-system perspective in Ecology.